Facebook, Twitter & Co. from the same mold – click.to HootSuite! Different readers, different channels. But a single message to the whole world? New results to report? 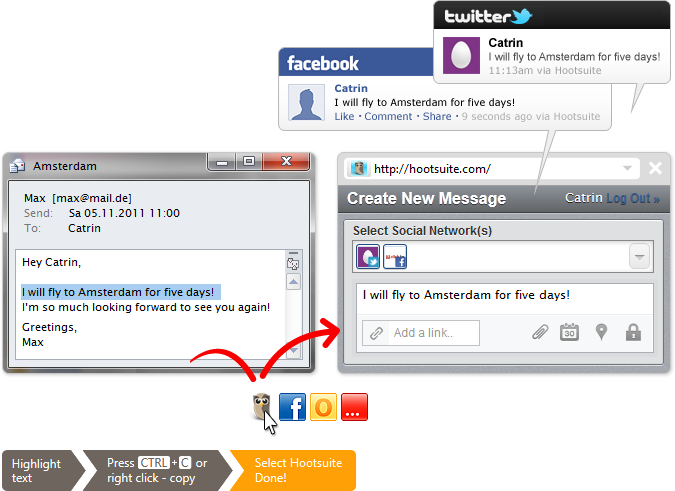 With click.to HootSuite you can reach your friends, family, colleagues and customers with one click. Simply highlight the desired text, copy using CTRL + C and click on the HootSuite icon above your mouse pointer. Your message is then automatically posted, tweeted, etc. to each registered HootSuite account.